Carolyn Wasilewski was a pretty blonde-haired girl who dated and hung around drapes, a variant of the greaser subculture popular in the 1950s. She was a freshman student at Southern High School in Baltimore, Maryland, and was called “Peaches” by her friends. On November 8, 1954, Carolyn told her family that she was going out to meet her friend Peggy Lamana. The two girls planned to sign up for a dance program at a local elementary school. Carolyn left her house at 6:15 PM, but never met up with Peggy. Her family got worried, and though they spent all night looking for her, found no trace of Carolyn. Later that morning, around 7 AM, an engineer on a train passing from Harrisburg to Baltimore suddenly slowed down and switched off course to another track. He saw a body lying on the initial trackline the train was taking, and when the police went to check it out, they discovered that it was Carolyn Wasilewski, dead and laying face down. Carolyn was found half-naked, but her body showed no signs of being sexually assaulted. She was covered in bruises and scratches. The name “Paul” was written in lipstick on her right thigh. Her skull and jaw had been battered, and one of her ring fingers was broken too. Police suspected that she was killed someplace else, and was then either tossed from an above bridge or moved to the track. The autopsy concluded that Carolyn died the night before, around 11 PM. 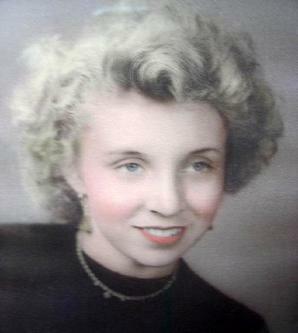 Newspaper picture of Carolyn Wasilewski. Near her house, and about 8 miles away from the railroad, police found bloodstains in a vacant lot. They also found Carolyn’s shoes and a few other personal items of hers. Over 300 people were questioned by the authorities, including local drapes, but Carolyn’s murderer was never identified. Police had two strong suspects, but both were eventually ruled out. The first was a man who sexually assaulted one of Carolyn’s friends. Carolyn testified against this man a week before her death. While he was brought in for questioning, police dismissed him, believing he had nothing to do with the crime. The other suspect was a middle-aged man named Ralph Garret. Garret lived in the area and was allegedly seen with Carolyn the night of the murder. Garret didn’t come home to his wife that night, and subsequently disappeared. His car was found abandoned 2 days later. out of town. The same day police started looking for him, a man stumbled upon Garret’s body near the same vacant lot where Carolyn’s bloodstains and shoes were found. He had committed suicide by hanging himself with a belt from “a brake wheel on top of a gondola car.” His suicide, however, was later deemed unrelated. According to Garret’s wife, he was depressed because his mother had died. Intrigued by this story? Click here to like us on Facebook and keep up to date with our latest articles.